Spice up your next gathering with these amazing meatballs. Try them as an appetizer, made into sliders or atop rice. In large bowl, gently combine all meatball ingredients until everything is evenly distributed. Form mixture into small balls, using 1 to 1 1/2 tablespoons of meat per ball. Place the meatballs onto a rimmed baking tray and into the oven. Bake for 10 minutes and turn the meatballs. Bake for another 10 minutes until cooked through. While the meatballs bake, combine all glaze ingredients in a small pot. Whisk and cook over medium heat for 5 minutes or until mixture is slightly thickened. To serve, toss or brush meatballs with warm glaze. 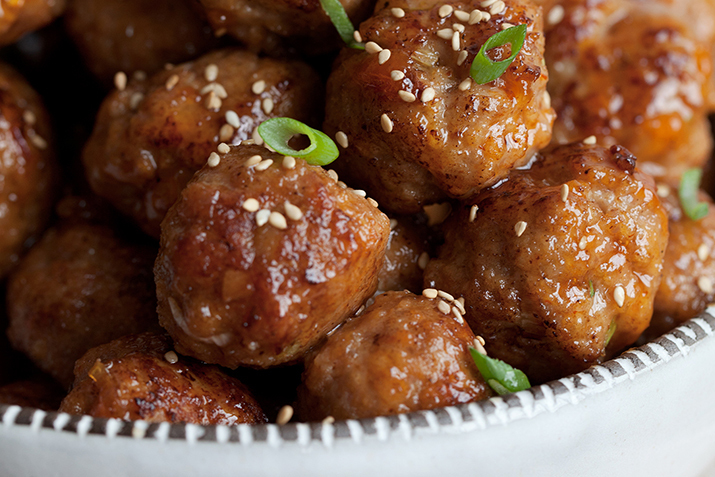 Served whole and garnished with sliced green onion or toasted sesame seeds on an appetizer platter or made into sliders, these meatballs really bring the heat if you double the amount of ginger and Sriracha in the mix. Make it a meal by serving the meatballs on a bed of steaming hot jasmine rice.